Photo by Genevieve Schmidt. A rhododendron which needs iron. The garden is finally showing real signs of spring, with new leaves unfurling from branches and spring bloomers putting on a show. Though the North Coast is still in a drought, in most years April's notorious showers and warming temperatures make it the perfect month to plant annual flowers and cold-hardy vegetables. The rain also makes it a good time to add lime and iron to plants that need it, because the water helps disperse granular products into the soil. Read on to find out what to focus on in the April garden. Deadhead rhododendrons and azaleas after bloom. The brown finished petals can mar leaf surfaces, and if rhododendrons are allowed to set seed, it steals energy from the plants which would be better used for foliage and flowers. For rhododendrons and deciduous azaleas, gently snap off the entire finished flower head, being careful not to damage new growth shoots that are emerging at the base. For evergreen azaleas, simply removing the petals is enough. Deadhead lilacs. Though many people are afraid to cut into their lilac's woody stems to make a bouquet, this is actually an ideal way of keeping the plant healthy. Pruning each of the flowering stems during or just after bloom encourages the plant to use energy growing leaves and flower buds rather than setting seeds, and is a good way of tidying up the plant's shape as well. Simply cut each flowering stem down by about 12 to 18 inches, making your cuts just above a set of leaves or shoots. The technique is the same for cutting fresh blooms as well as removing finished flowers. Add some flowers to the mix. If the only things blooming in your garden right now are the remains of spring bulbs, consider a few early blooming shrubs to add color to your design. Forsythia's bare stems become covered with golden blooms in early April, and its slightly wild vase-shaped habit can be left natural or hedged for a more formal look. Passion Frost lily of the valley shrub (Pieris 'Passion Frost') is a newer variety which is variegated and has pink flowers, rather than the usual white. The odd, snail-shaped red blooms of many grevilleas attract hummingbirds and come in a variety of shapes and sizes from groundcovers to substantial shrubs. All three types of shrub are deer resistant. Thin clumps of Candy Cane bamboo. Candy Cane bamboo is a popular clumping variety which has vivid red and green stripes on young stems. However, after a year or two, the stems get thick and fade to a dull yellow. Each year, I like to remove about a quarter to one-third of the oldest, thickest stems to make way for the colorful new growth to arrive. Just cut them out at the base using your loppers. Bamboo stems have a hard outer shell which can be challenging to cut using normal loppers, so I use Fiskars PowerGear loppers for the added leverage they provide. Plant starts of cold-hardy vegetables. All of the nurseries seem to be having spring sales and fresh new shipments of vegetable starts. Now's the time to plant starts of Swiss chard, cabbage, bok choy, cauliflower, broccoli, mustard greens, lettuce, celery, parsley and cilantro. You can sow carrots and beets directly in the garden. Just don't get sucked in by tomatoes and squash yet, unless you have a greenhouse. Even protected in a cold frame or wall-o-water, we are still getting enough frost that you'll probably lose them. Start plotting your annual display. April's showers will ensure you don't need to water much after you plant starts of dianthus, calendula, pansy, dusty miller, snapdragons and sweet alyssum. It's not too late to set out seeds of nasturtium and sweet peas as well. If the usual annuals seem passé in your style of garden, seek out either newer or heirloom varieties which have more delicately-shaped flowers, nuanced colors and patterns, and can fit into contemporary, naturalistic or other garden themes without looking like someone plunked grandma's flowerboxes in the middle of your garden bed. Annie's Annuals has some lovely old-fashioned dianthus varieties that are made for either cutting or fragrance. 'Chomley Farran' is a bizarrely striped cutting variety in purple and fuchsia, while D. arenarius has fragrant white frizzled blooms which look like little starbursts. If you like warm amber tones in the garden, try Nasturtium 'Evelyn', or Chantilly Peach snapdragon (Antirrhinum 'Chantilly Peach'), either of which intermingle beautifully with purple-flowering plants such as catmint or Geranium 'Bill Wallis'. Apply iron as needed. 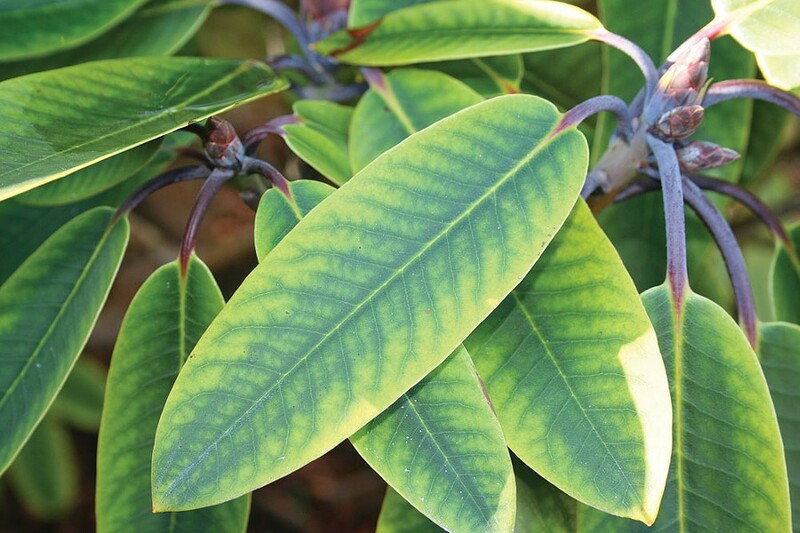 If rhododendrons, camellias and other shrubs have green veins but yellow leaves, it's a sign they could use some iron. Similarly, if boxwood still hasn't shaken off that bronzey-golden winter color, it too might appreciate a dose. Ironite is available as a liquid which can be applied from a sprayer, or as a granular product which you can sprinkle around the dripline of each plant. Apply quick lime to lawn. Here on the North Coast, our soils are often a bit on the acidic side, which can make it tough for turfgrass to absorb nutrients and outcompete weeds. Nurseries have inexpensive soil pH kits which can tell you in a moment whether or not you need to add lime, though a common clue is moss growing in the lawn. If your pH test shows that your soil is below the optimum pH of 6.0 to 7.0 for lawns, an application of Super Sweet lime can help your grass make better use of the nutrients that are already existing in your soil. Apply lime to alkaline-loving plants. Having the right pH makes sure that plants have just the right nutrients they've evolved to expect. While plants like azaleas and blueberries prefer acidic soil, plants such as California lilac (Ceanothus), mock orange (Philadelphus), boxwood, Deutzia, Daphne, Spirea, Weigela, lilac, clematis, Brunnera and hellebore all have a preference for soil in the slightly alkaline range. If your soil test shows your pH around these plants is less than 6.0, consider sprinkling a bit of lime around the dripline to ensure they are able to thrive. Force a begonia tuber. If you're itching to get outside but the rain is scaring you off, consider starting a begonia indoors. Those trendy terrariums and decorative cloches can be used to start a begonia tuber, which makes a satisfyingly quick indoor display of foliage and gives you a jumpstart on the season. Once the begonia gets large enough to begin blooming, transplant it outdoors into a hanging basket or a pot by your front door. I love having some small touchpoint with nature on my desk, and when a plant is encased in a heavy layer of glass, mischievous cats and flailing babies have to work a lot harder to shred the foliage. Genevieve Schmidt is a landscape designer and owns a fine landscape maintenance company in Arcata. She blogs over at www.NorthCoastGardening.com.